The Rusty Lands are being attacked by ruthless Robot Dismantlers! These machines are wreaking havoc and causing chaos and destruction. You are the Hunter. Through the smoke and steam, among the mountains of metal, through the abandoned buildings and boiling lava, you must track down and capture all of the Dismantlers. 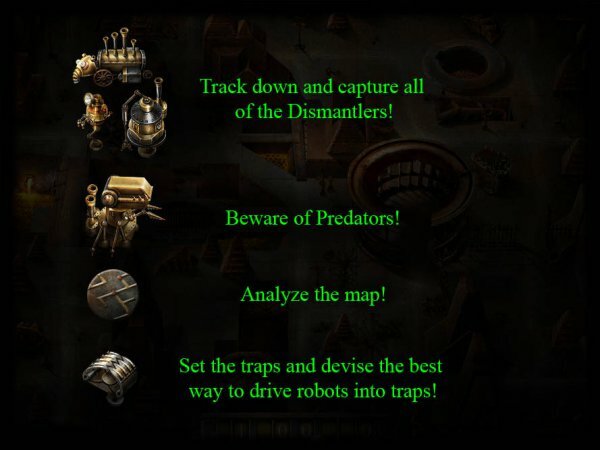 Devise the best way to drive robots into your traps and use movement beacons to notify you when a robot passes one. You have a limited number of turns on each level before you run out of fuel. And beware of Predators! They not only attack other Dismantlers but can strike at you as well! Think over your moves in advance, so that you have enough fuel to complete the mission.